John is the son of former Cllr. Percy Clendennen, who retired from public life in May 2014, having served on Offaly County Council for over forty years. 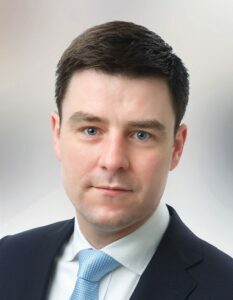 John has a Degree in Business Studies and Hotel Management (Shannon College of Hotel Management 2004), and a Masters Degree in Marketing (UCD Michael Smurfit School of Business 2009). John has worked in the commercial side of the Hospitality Sector both in Ireland and internationally, and received numerous accolades in recognition of his achievements within the sector. In 2010, he returned to Kinnitty to undertake a full-time role in the family business and has advanced a number of projects since, which include Giltrap’s Pub in the centre of Kinnitty, Glendine ‘Glamping’ & Bike Hire and SimpQ Mobile Photography Studios. John was elected as Leas-Cathaoirleach of Offaly County Council, for 2017-18.